It was a match full of blast. Accompanying thousands of other loud Canadian fans from the closest pub towards BMO field, I witnessed the Canadian flag rising more than ever. I was quite surprised to see over 17,000 fans fill- the usually low attended- BMO field in Toronto. Before entering the pitch though, I heard loud cheers coming from 2nd level of stadium. There I saw Canada women national team members being cheered and applauded by Canadians as they were sitting in their spots. Canada women national team performed a glorifying Olympic football tournament in London recently, and recorded Canada’s first ever medal(Bronze) in team sport in Canada’s sport history. It was a great boost to the moral of football fans at BMO field, and surely to Canada’s men football national team as they’d face their crucial World Cup qualifier opponent Panama momentarily. 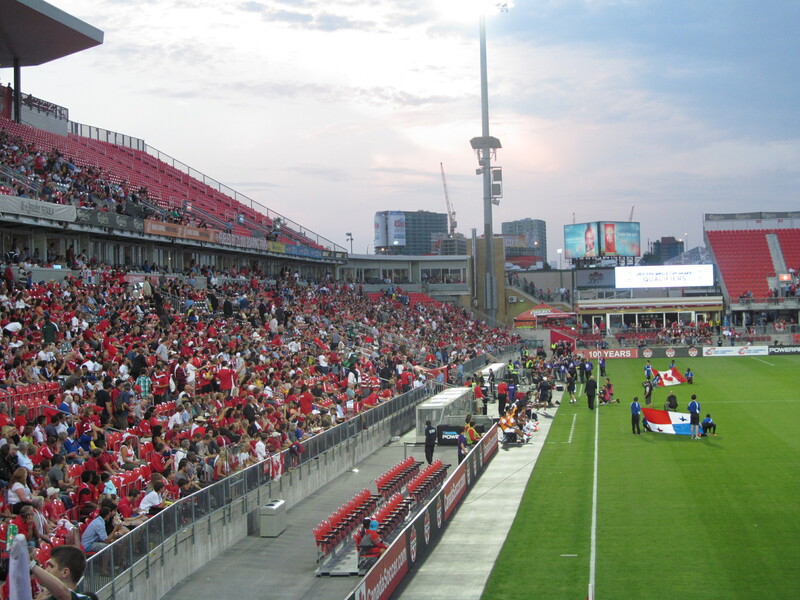 Few minutes before the kick-off, BMO Field’s announcer mentioned the presence of Canada women football national team which were accompanied by thousands of cheering fans. Then as a courtesy of appreciation for their heroic performance at London Olympics, and their record-breaking status, Canada Football Federation invited them to the pitch, with standing ovation of 17,000 fans, calling each of the player one by one and giving the Captain a framed Certificate of appreciation. That gratitude definitely put smile on faces of Canada women team, and thousands of fans. There went the kick-off whistle of Canada-Panama match on Friday September 7th. As expected, it was a close-contested match between the two teams considering Panama lined up a cohesive defense, with physically strong attacking midfielders. On the other hand, Canada’s goalkeeper, Lars Hirschfled and defenders displayed a solid performance all-along despite Panama’s numerous attack threats. In the meantime, Canada’s attacking chances were either easily saved or unluckily hit the post or miss by marginal distance. Until Dwayne De Rosario sealed Canada’s crucial win over Panama in minute 77. Hutchinson’s quick restart on the edge of the area caught the Panamanian defence scrambling, allowing De Rosario to sneak in at the back post to slam home his winner. The remaining match included some time-wasting by Panama players to get free-kicks or some yellow cards for Canada, but that did not change the scoreline. Canada currently tops the Group C of CONCACAF World Cup qualifiers, followed closely by Panama and Honduras. Cuba remains without any point at the bottom of the table. Today’s away match at Panama, 9pm EST, is even more crucial for Canada, and there are already reports of Panama fans starting fire outside Canadians’ hotels today. If Canada can manage to secure 3 points out of this match, they would be almost rest assured of top spot finish to 4th round of qualifiers. Fingers crossed for today’s crucial points for Canada. September 11, 2012 in Club football.